Read on for the latest news from the TRT team, and trip reports posted by our leaders and clients. Tell us what you think of our new website! Well, you’ve probably noticed things have changed a little round here. The new TRT website went live today in time for the start of the autumn season in Nepal next month, and we’d love to know what you think of it. As of today we’ll be posting regular news items here to keep you up to date on what’s happening with our trips and the charitable projects your money goes towards supporting in Nepal. From now on we’ll be asking our leaders to post reports to the website at the end of every trip we run, to give you a better idea of what it’s like to travel with The Responsible Travellers. We like to think we offer a unique experience to those of you who travel with us, by providing a high quality of service to our clients, while looking after and training the many staff who help to make your trip the experience of a lifetime – from leaders, sirdars, cooks, guides and porters, to the lodge keepers and homestay families who put us up for the night – and by travelling to little-visited and unusual parts of Nepal so that other areas of the country can benefit from tourist income. But in order to keep us focused and offer continuous improvement, we need your feedback. All pages of the new website allow commenting. If you have any views on the content of the site, then we’d love to hear them, so please don’t be shy about posting your comments and starting a discussion. And we don’t just expect you to come to our website to find out what we’re up to – we’d like to keep you updated in the places you visit more frequently. 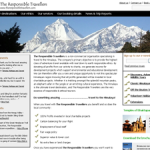 For this reason we’ve also set up new channels for The Responsible Travellers on Facebook and Twitter, and if you’ve never been to the Himalayas and want to see what it’s like, or if you’re one of the many people who visit again and again and want to remind yourself how beautiful they are, then check out the stunning photographs on our Flickr channel. And if you don’t use any of these, you can always sign up to our good old-fashioned e-newsletter or subscribe to our RSS feed. So have a look round, post a comment and let us know what you think. And better still, when you’ve done that, why not book a trip, and we’ll give you a warm welcome in Kathmandu! © 2019, The Responsible Travellers Ltd. Registered company no. 5912731. Site powered by WordPress.